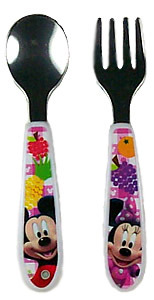 2-piece set includes stainless steel spoon and fork with durable plastic handles. Dishwasher safe (top rack). BPA, PVC, and phthalate free.